Baby Morgan joined us on March 15th at 6:34AM, weighing 7 lbs 11oz. I was 38w3d. My contractions were occurring consistently every 20-30 min the evening of March 14th. By 3AM, they were about 3-4min apart, which is when we headed to the hospital. I was admitted at 4AM (6 cm dilated) and 2.5 hours later, baby girl was here! It happened very quickly but I was exhausted — mostly due to the lack of sleep. However, the moment I held her, nothing else mattered. The pain and exhaustion was so worth it. She’s absolutely precious. Sleep: Good. Getting about 7 hrs a night and just getting up once. Mood: Excited to meet my little girl. Anxious about not knowing when and where it’ll all start happening. Nervous about dealing with a newborn and a toddler. I’m an amateur photographer who owns a secondhand Canon Rebel T2i camera. I learned that for occasional, amateur photographers, the camera body is all you really need. There are places like Henry’s or Vistek that rent out lenses, so you can pick one up for $30/weekend. And they have all kinds of lenses, so you can select one based on the kind of photos you want to take. I used the Sigma 35mm ART 1.4 lens, which retails for about $900US. I really could have got away with just using my kit lens, but I wanted to use this as a learning opportunity as well. Remote – A remote would definitely make things easier. My remote decided to stop working, so I relied on the timer. Prop or stand-in – I used my son’s large Olaf doll as a prop to set focus. I would put the doll in my spot and set my AF (auto focus) point and then switch my lens to MF (manual focus) so the lens wouldn’t refocus when I switched out Olaf for myself. I shot all my photos as RAW files and used Adobe Photoshop. I don’t quite understand RAW files but if you have the time to play around with editing, make sure your camera is set up to save this way. This will give you the most editing flexibility/creative options. I don’t wear a lot of makeup, so I had to make a few adjustments to my daily look for it to be “camera ready.” I added a little more eyeliner, darker eyeshadow, blush and lipstick, and I was good to go. I used a few outfits that I already owned. The good thing about photos is that you can “fake” the fit of clothing. The item of clothing doesn’t necessarily need to fit right. You can pin things up or leave things open and just hide these alterations from the camera. I also quickly made a dress from a jersey knit and stretch lace. The fabric cost me $10 and I spent about an hour putting it together. It looks pretty plain in person, but I think the lace turned out great on camera. Four more weeks until full term! I’ve been counting down the weeks because I’ve been a bit nervous about baby lately. At my 29-week appointment, my fundal height was measuring unusually small at about 24 cm, which prompted my OB to send me for an ultrasound for further investigation. He did say that these measurements weren’t always accurate, hence the ultrasound. Regardless, of course I did some Googling — what if the baby wasn’t growing? What if she had some sort of disorder? What if I deliver prematurely due to complications? The answers weren’t always positive. All these worries for nothing though, because my ultrasound actually not only confirmed the baby wasn’t small but she’s in the 68th percentile. The baby’s head is down and everything is where it should be. So, we’re still on track! Total weight gain: 28lbs… and feeling very heavy. I’m still doing prenatal bootcamp but I’m getting slower each week. It’s becoming more difficult to keep active, but I’m trying! I even joined a few Fitbit challenges to help motivate me. Highlights: I sorted through and washed all the hand-me-down clothes I received for the baby. Going through all the cute girl clothes has been very exciting. 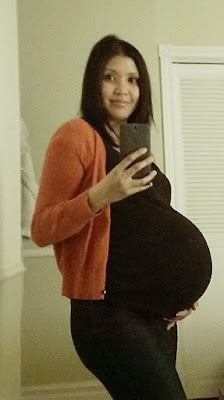 To compare, here’s my post at 34 weeks for my first pregnancy.